We believe that people, our managers, our permanent staff, our temporaries and our students represent the brick and mortar of our company. It is through people producing the finest quality product available, we will continue to forge our future. We will always recognize that our customers are the vital key to our future. We are obligated to our customers to deliver the finest and we have promised to do so in full measure. Hawkins Cheezies® is synonymous with wholesome goodness. Natural ingredients and real aged cheddar cheese were the impetus in the development of this purely Canadian icon. W.T. Hawkins Ltd. was founded in small town Ontario from a revolutionary idea first created in the United States. The Hawkins success of today is a natural reflection of this family-based business' past. Founding owner, W.T. 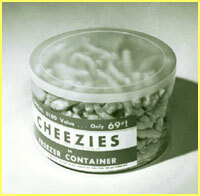 Hawkins and Jim Marker, who is the actual developer of Cheezies®, had spent years in Chicago in the confectionery industry perfecting their craft. The popularity of the Cheezie brand, a technique of extruding cornmeal into various shapes, cooking them in vegetable shortening and then coating them in aged cheddar cheese, was growing and the expansion of a new enterprise was looming. Hawkins and Marker decided to head north with their product and soon a Canadian tradition was born. Initially located in Tweed, Ontario - a strategic choice to take advantage of the rail lines between Toronto and Montreal - production of the Cheezie grew along with the public's appetite for this unique snack food. Almost a decade of growth occurred before tragedy struck. A fire leveled the factory in 1956 and a move to the present-day location in Belleville was quickly made. Now in its 52nd year, W.T. Hawkins Ltd. is running strong and is still under the watchful eyes of the progeny of W.T Hawkins and the two people who had a huge influence in the company's success from the early years - Jim Marker and Shirley Woodcox.